Nothing captured the mindless hysteria of prohibitionists quite like the 1936 film Reefer Madness, where pot users were portrayed killing people, committing suicide and going mad. Eighty-one years later, some people – such as Attorney General Jeff Sessions – still push falsehoods and propaganda about cannabis. The war on drugs is too profitable to the State and the corporatocracy. Big Pharma funded propaganda campaigns in 2016 as nine states were voting whether to legalize medical and/or recreational cannabis. Thankfully, the propaganda had little effect, as all but one state voted for freedom. Part of the prohibitionist strategy is to try and convince you that cannabis does bad things to people, and can even cause death. But, unlike other drugs – including alcohol and cigarettes – no one has ever died from ingesting cannabis. There is not a single recorded fatal overdose from cannabis. In fact, responsible use of cannabis, including oil extracts, can be quite beneficial to the health, which is why states are continually adding to the list of allowable health conditions treated by medical cannabis. We are only just beginning to understand the body’s endocannabinoid system and how cannabis can be used to stimulate this system to reduce inflammation, which is thought to be the cause of many diseases. Despite the fact that cannabis does not kill people and does not cause the harmful effects of legal drugs, it remains a Schedule 1 controlled substance – the most dangerous category. To illustrate the absurdity of the situation, it helps to compare cannabis to things that actually do kill people. Among them: icicles, cows, scalding tap water, vending machines, lightning strikes, pencils, hot dogs, jellyfish, fireworks, champagne corks and coconuts. A relatively recent entry on the list of odd things that kill people, albeit rarely, is the selfie. Smart phones and a lack of awareness are combining to tragically end the lives of a surprising number of people. 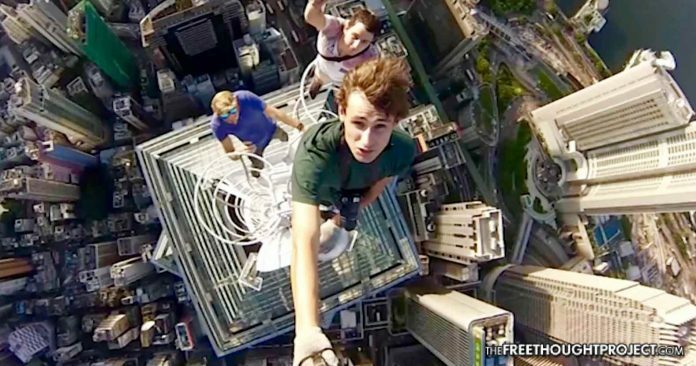 Between March 2014 and Sept. 2016, there have been 127 recorded selfie deaths around the world, according to researchers from the U.S. and India. The vast majority – 76 – have occurred in India, while eight selfie deaths have been recorded in the U.S. Meanwhile, no one has ever died from cannabis. But government still feels the need to put cannabis in the most dangerous category of controlled substances under strict prohibition. Government will lock you in a cage, tear your family apart, take away your money and possessions, and even kill you for possessing a plant that has been used by humans for thousands of years. In fact, the most dangerous part about having pot is the chance of police killing you over it or hauling you to jail. The Free Thought Project has documented many instances of this happening. 19-year-old Zachary Hammond was shot and killed at point blank range by South Carolina police officer Mark Tiller in a sting operation over a few grams of pot. 17-year-old Jonathan Santanella was shot and killed in his car by Texas police officer Rey Garza, who thought he saw some pot in Santanella’s car. The stories are numerous and tragic, and they underscore the injustice of the drug war. Cannabis never killed anyone. It is a medicinal plant with so much potential to heal, if only government would get out of the way.